During the last few weeks the Richmond, VA area has been buried by Old Man Winter. We have spent our time bundled up in our warm house, staring out into the deceptively sunny yard. Deceptive because it looks lovely out, but don't be fooled it's FAH-REEZING out there. 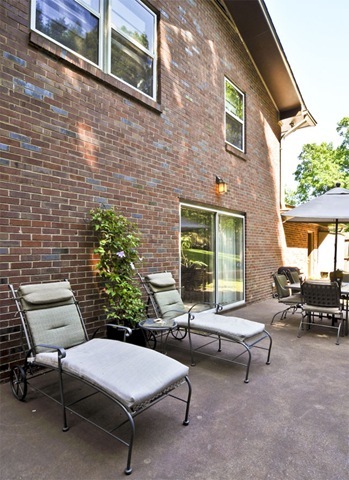 This weather has me dreaming of spring and summer and the opportunity to spend some time on the deck of our new home. 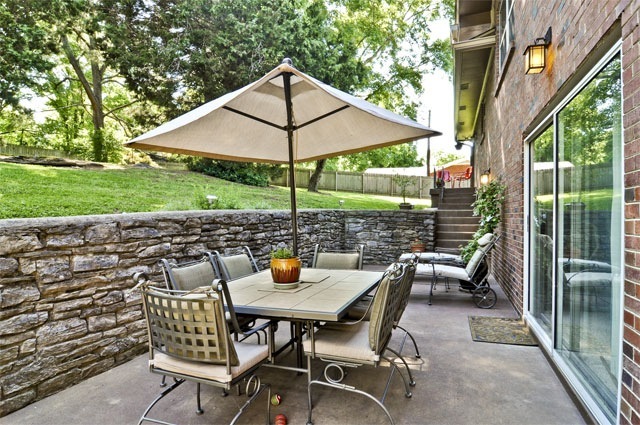 The deck is a great size for our table and chairs, plus our loungers and small grill have a little spot too. I hope to put together some pretty potted gardens and maybe give the wood a little facelift with a sanding and some stain once warmer weather rolls in. 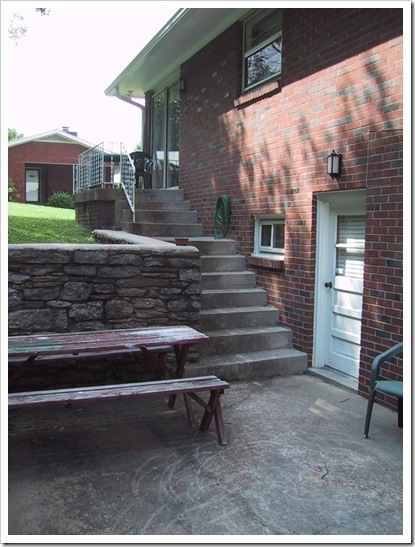 While dreaming of the chance to start those little outdoor projects I am reminded of how we transformed our concrete patio at our 1960's Tri-Level home back in Nashville, TN. 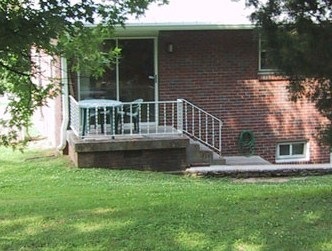 Our old home sat up on a hill and the patio was sort of carved into the hillside behind the house. 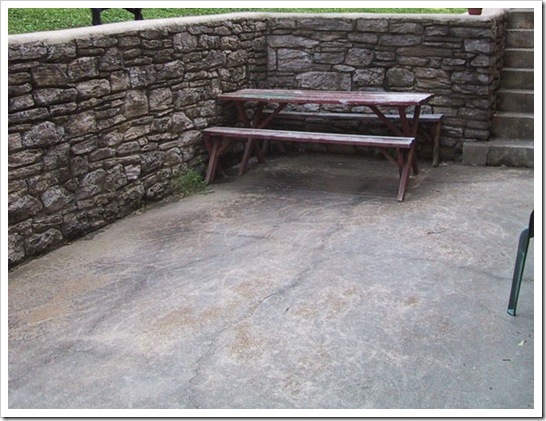 The stacked stone retaining wall around the patio was made from the rock that was dug up during the construction phase. 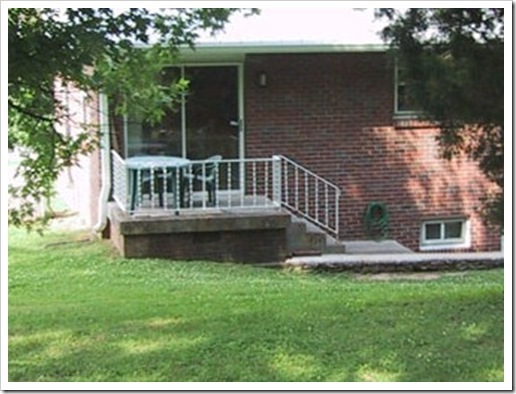 We loved the look of the old wall, but over the years the concrete patio slab was cracked and very dingy looking. Along with the staircase up to the smaller patio off the kitchen, the whole back portion of the house just looked old and uninspired. 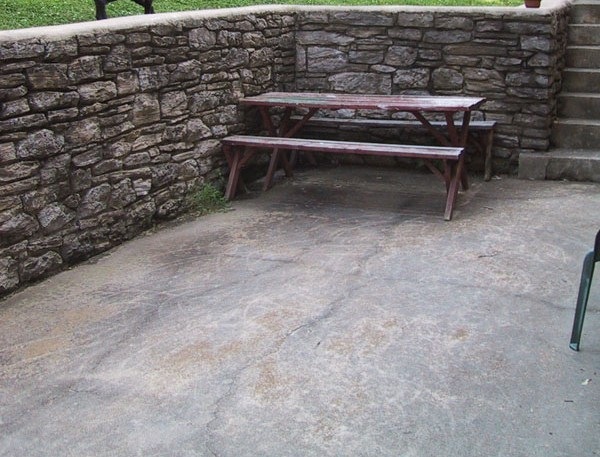 We started with a good power washing, but that resulted in a lighter gray concrete that looked new and bright against the old mossy stone wall. It just looked wrong and the cracks seemed to stand out even more. Basically all the concrete areas around our home needed help and power washing alone was not going to cut it. That is when we opted to try out concrete stain. At first we were pretty intimidated by using a product that could end up looking bad on a surface we could not sand down and/or easily change. What if we ended up with drips or areas that were lighter or darker than we wanted? Would we be stuck with a mess or mistake forever? After much hemming and hawing we took the plunge and purchased one gallon of a reddish brown and one gallon of dark brown stain (we got these at Lowe’s and unfortunately I cannot give specifics because they no longer sell the brand we used. However it was very basic stain). Prior to applying the stain we cleaned the concrete again with an etching wash and then used concrete crack filler that contained sand and could be stained to blend in. Even though the product said it would hold stain we purchased a brown color just to help it along a bit. Once the cracks were filled up and dried we started staining. We followed the recommended application process to the letter and also purchased an inexpensive garden sprayer for the red highlight color and opted to roll on the base of dark brown. The idea is that you roll out the base to the desired tint and then randomly spray the highlight color on top of the base while still wet. Then to aid in making the colors look a little more like natural stone (as much as concrete slabs can) we used the roller again to lightly blend the colors and soften the overlapped edges. 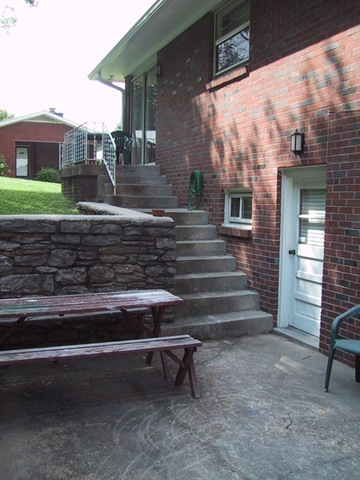 One other thing to mention, that became a part of this project, was the decrepit wrought iron handrail along the upper patio outside the kitchen, as well as, the front porch. Both railings were covered in old white paint that was peeling off in huge chunks with layers of rust flaking away underneath. 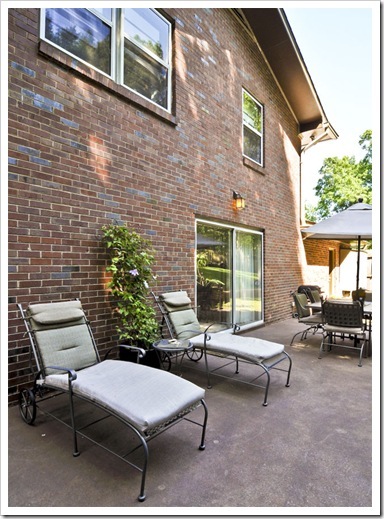 Even though the project started as a way to make our back patio more inviting it connected directly with the back steps up to the patio off the kitchen, so we felt that we had to prepare this as one BIG project. 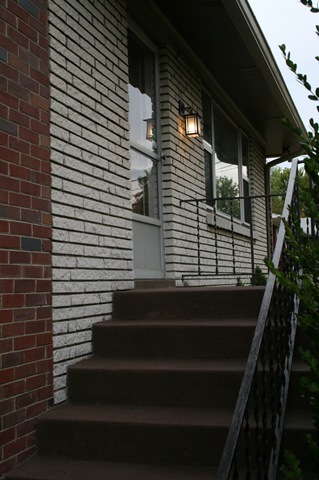 And, since we did not want the back of our house to look so much better than the front (first impressions, ya know!) we included that area too. So, before we stained the kitchen patio and the front stoop we cleaned up both handrails. 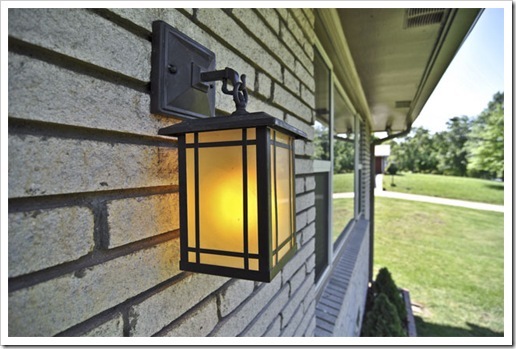 I striped all the old chipping paint off, then we primed and spray painted the railing with a hammered bronze color that perfectly matched the new outdoor lights we planned to swap for the old ones. The handrails looked like they had just been installed once we were finished It was a total transformation. The rich color shows well in this photo that I took immediately after completing the front stoop. The next two were taken two summers later and in brighter light, but the color is still quite deep and dark. In the end we were able to apply this staining process to the back patio, up the back steps, across the small patio off the kitchen and up the front door steps and across the stoop. 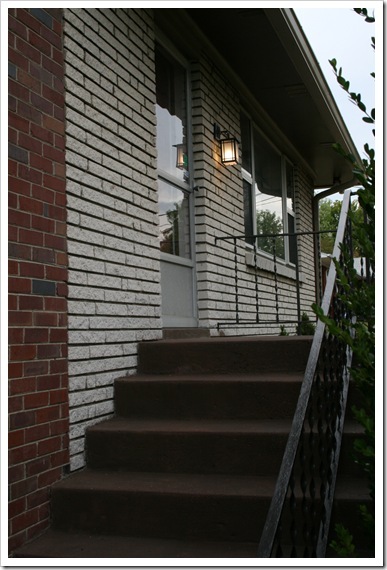 We ended up with a deep reddish brown mottled color that looked amazing against the red brick of the house. The main color of the brick is red, but with dark green and several shades of brown mixed in. So, the deep reddish brown of the stain made all of the concrete areas around the home look completely different. Everything just blended very well and the new concrete color created a much smoother transition with the old stacked stone wall. 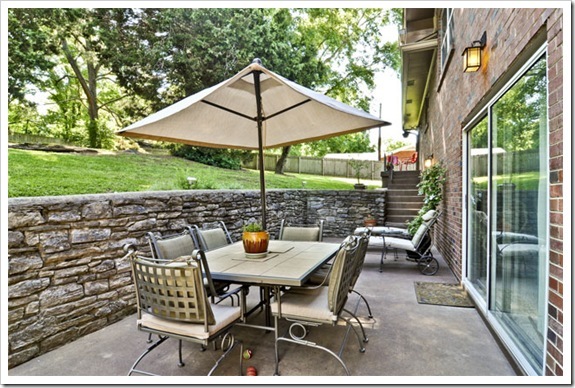 In the end, all of our outdoor areas were much more cohesive and inviting. 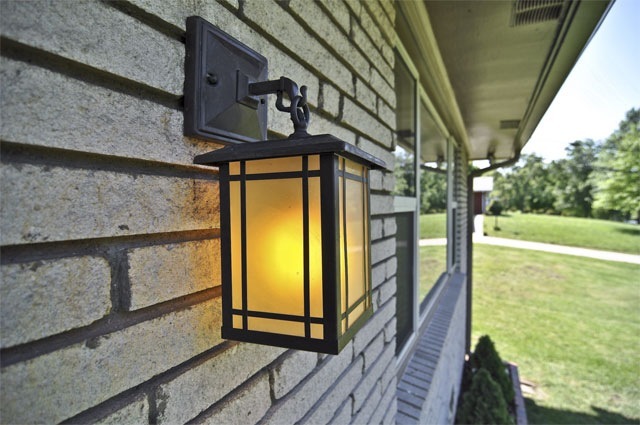 So tell me about your fun outdoor perk-ups and projects! Are you planning anything for the spring already?